In April 2018, we will celebrate the 60th anniversary from the moment of creation of the first sushi restaurant with a tape conveyor. Not long after its creation, this format became very popular not only in Japan, but also abroad. Nowadays, overcrowded «Ganko Kaitenzushi» in Shinsaybashi (Tyuo's district, Osaka) is more crowded with foreign tourists than with locals. 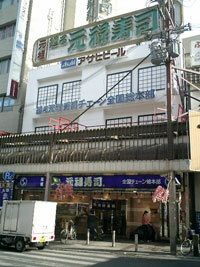 «Mawaru Genrokuzushi», the first sushi restaurant with an installed conveyor was opened in Fuse City in 1958. Today it is Higashiosaka, prefecture of Osaka. The owner Yoshiaki Shiraishi, having had personnel problems, equipped the restaurant with a conveyor after he saw a similar one in Asahi brewery. He believed that it could reduce the work of waiters. At that time, four pieces of sushi on a plate cost 50 yen and a bowl of ramen noodles was about 40 yen. Restaurants became very popular because Shiraishi dreamed of making sushi available to ordinary people — at that time sushi was considered a luxury food. The format of kaiten-sushi gained mass popularity after 1970 — after the presentation of the kaiten-conveyor at the World Fair in Osaka. The next surge of interest in kaiten was in the 1980s, when it became more fashionable to eat outdoors than in earlier periods. And finally, in the mid-1990s, after another financial crisis, inexpensive restaurants became popular. Nowadays, in Japan, there are about 2000-2500 restaurants with conveyors. In Europe, the USA, Asia, and Australia — about 1500-2000 restaurants with kaiten conveyors.